How is your contact page? Does it command customer attention, or is it just text and a field to type a message? Customers click on the contact us link when there’re interested in your company, that’s why you should have an impressive contact us page. Let’s look at some amazing contact us pages as an example. Wendy’s has become notorious for roasting customers by request on Twitter. 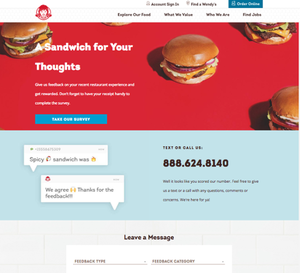 Their contact us page keeps that tongue-and-cheek approach with the headline “A sandwich for your thoughts”. 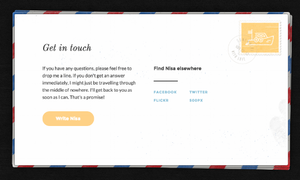 The page has an appealing design including a survey, a straightforward message form, and a way to call or text. 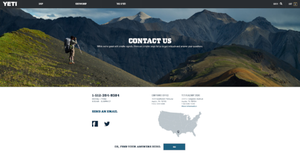 A clean and uncomplicated design always works for a contact us page. The last thing your company wants is to discourage users by overloading them with information. 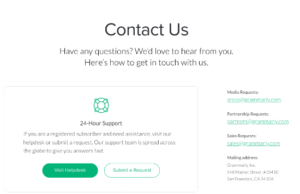 Grammarly keeps it simple, with information to the right of the page, CTAs for a request submission and helpdesk; all while keeping with their brand. An ornate design is unnecessary in order to have an effective about us page. Moz shows that less is more. 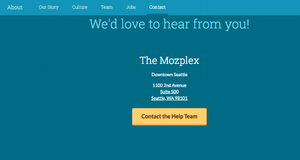 Using a single color background Moz includes just a map (not shown), their addresses, and a CTA for their help center. The page doesn’t confuse users and the CTA gives them exactly what they need. You or someone you know probably has a Yeti Cup. As well crafted as their cups are, their contact us page is even better crafted. There is a stunning image on top of the page, it is easy to read and uncluttered; they even inject some humor. They link to the social media platforms Yeti is on, list their phone number, office info, and their email. Their CTA for FAQs helps the customer without needing customer service. 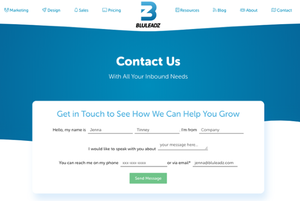 The contact us page for Bluleadz is not your run of the mill format. In keeping with their brand they have designed it to resemble a Mad-Libs game played by kids. Filling in spaces on the page instead of fields makes the experience fun. Below the form are a map to their office, their address, phone number, and email. They use their CTAs as a tool to recruit bloggers and employees. There is a reason Coca-Cola has been around for over a century, they have a great product and have always had effective marketing, so it makes sense their contact us page would be great. A chat box pops up as soon as a user logs on to the page, getting right to the point. There are links at the top of the page for FAQ’s, Social Media, suggestions and a background with splashy graphics. In keeping with their branding, Let’s Travel Somewhere’s contact us page looks like a postcard and stands out while showcasing their brand. There are CTAs and links to social media included. 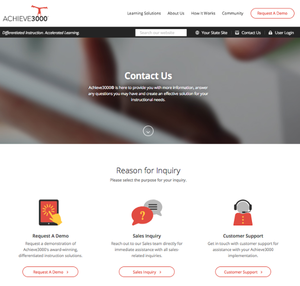 You find what you’re looking for quickly with the three CTAs on Achieve 3000’s contact us page. Clutter is not how you would describe it. Request a Demo, sales inquiry, customer support are the only links; simplicity itself. The contact us page for Uber conference is tidy and has a friendly feel to it. 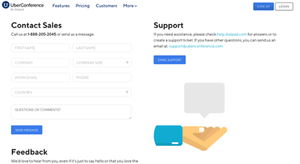 With a graphic of a helping hand, CTAs for feedback and support, plus a clearly displayed phone number Uber Conference puts a premium on ease of use. Keeping things simple means ease of use for customers, and an influx of leads for your company. Let MosierData help you with all your website needs.